It is not so easy to find a small publisher able to release more than 1-2 games in a year. It is much more difficult if 3 of these are really new releases and it becomes extremely rare to have all these releases at good level. It is rare but not impossible because, according to my tastes, Minion Games 2011 has been an impressive year. Apart from the nice new edition of Nile Deluxor, that I have reviewed here months ago, and the solid little Kingdom of Solomon, Greg described in his review, other two titles hit my table and impressed me positive: Venture Forth (I’m going to review in the next weeks) and the largely attended The Manhattan Project that monopolized my gaming sessions since his arrive. 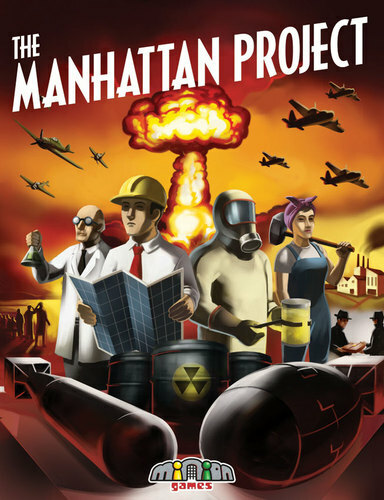 Today I’m going to review Manhattan Project, the just released first work from Brandon Tibbetts. The Manhattan Project live in the huge family of worker-placement games but has some really good twist that make it fresh and new, starting from the unstructured way to place and retrieve laborers on the map … but we have to start from the beginning. “A revolutionary new technology has been discovered. Immediately, every major military power recognizes its destructive potential. Can your nation take the lead in this new arms race and become the world’s dominant superpower ? And that is really the aim of the game: all you done with your workers, scientists and engineers is aimed to the constructions and loading of bombs! Only Bombs bring you Victory Points so, if it was not clear, you need to build and load bombs to win. Before going into the details I have to prise how the rules are written: clear to read, with the right examples and a layout resembling a second-world-war newspapers. For people like me used to read tens of games rules every week it was really a breath of fresh air. Also the graphics of the board, cards and counters it’s clear and nice and the laborers are made of huge cardboard (actually I think I never seen counters so thick!). All the game is packed in a not too much big box, that it also a breath of fresh air for my overloaded bookshelves! To score points you need first to design a bomb and build it. To design a bomb you need a scientist and an engineer. To build you need also some Uranium or Plutonium. You can get this from “yellowcake”, that is natural uranium. Laborers (workers, scientists, engineers), resources (yellowcake, uranium, plutonium), aircrafts (fighters and bombers), money and cards (bombs and buildings) are all the components of this deadly race: how to get, how to use and better combine is the road to the victory. Every player start with 4 workers, 10 dollars, 1 Fighter and 1 Bomber (yes it is, we are talking about a bomb building race and, of course, it will be not peaceful) and something more according to the turn order. It looks me that the bonuses given to players going after in the turn order are well balanced and from my plays it looks like there isn’t a really advantaged position. The 6 starting buildings cards and one random building card are placed on the map: some bombs design (one more than players) are revealed and we can start. During a turn a player can place laborers or retrieve laborers. Of course usually you make the retrieve action when you have no more to place but that’s not always true. Laborers can be placed both on the board and on your building cards but you can place only a single laborer on the map. If you make the place action you can also take bombs actions. The first action you can do is place a laborer to get a building card: it cost from 2 to 20 dollars (the left-most card being the less expansive) but you can get it from free from the first two position using an engineer. During the game the buildings cards shift to left: so if you need really a card you have to pay it a lot or wait it make its road to the left … but of course other players can steal it from you. The construction space is the only space on the map can host more than one laborers. You can place a laborer in one of the 5 factory places getting aircrafts or money. Some space cost you yellowcakes (to get money) or need specialist laborers (scientist or engineer). The 3 mines spaces will give you yellowcakes but only one is “free”: one cost you money and another one need an engineer. The reactor space gives you a plutonium resource using yellowcakes and a scientist. To produce uranium you need also money. The Design bomb space need the placement of both an engineer and a scientist: than you can take all the revealed bombs cards, select one and pass it to player on your left. This proceed until you get back the last card: taking the design bomb is important both because you get two cards and you are the first to choose among the revealed ones. It is clear just now that you need engineers and scientists since your 4 starting workers are useless on some spaces. To get specialists you need to study: the 4 university place will give you more workers, engineers or scientists. Every player can hire during the game 4 permanent engineers and 4 permanent scientists that, once entered in play, will go in the player supply during the retrieve action. There are also Contractors (workers and specialists) than can be hired and used but will go in the general supply after a retrieve action (actually one-shot laborers). Since it is a worker (laborers) placement game you need laborers to make your production engine works and you have to hire soon to be able to compete. Laborers are also used on building cards. Construction space will give you a building card you can place on your personal board: there is no limit on construction cards but, for my experience, the 10 spaces on the personal board are enough. There are 5 types of buildings: mines (to produce yellowcakes), factories (to produce aircrafts and money), university (to get laborers), reactors (to get plutonium) and enrichment plants (to get uranium). All the buildings cards needs one ore more laborers to activate: sometimes it is needed a specialist, sometimes also money and/or resources. During your turn you can place laborers on how many building cards as you want as long as you fulfill the requirements and the building is not damaged. Damaged ? Yes it is! What do you think bombers are built for ? And than we go to the two air strike action spaces on the mapboard. Placing a worker there allow you to launch as many air-strikes as you want: you can use fighters to destroy enemy aircraft (one fighter goes away and one enemy aircraft follow him) or to damage buildings (one bombers is spent for each damage done). You can attack how many times and how many players you like as long as you have fighters and bombers. You need to destroy all enemy fighters before damaging his buildings. It is expressly wrote on the rules that you can make arrangement (binding arrangements) to how use the air-strike space. Striking is the only (actually the best) way to stop a winning nation production engine. Of course using your fighters offensively offers your side to counterattacks: that is the reason why the rules suggest to make agreements how to use the air-strike spaces, agreements that has to be honored. If both the air-strike space are occupied you have time to build up your squadron again. The game without using air-strike is much more quick: you can’t use damaged buildings and you need to use the repair action (on the map) and pay money to remove building damage. Since during your turn you can use just only 1 action on the map it means you loose a turn and some money to be ready again after an attack. The last action on the map is espionage that let you use one or more opponents buildings. How espionage works, combined with the place/retrieve mechanic, is one of the things I like most of this game. Placing a laborer on espionage space and paying 3 dollars let you get one spy (you can have maximum 6 spies) and use all your spies to place laborers on opponents buildings: one building for each spy. The spies are not consumed so, every time you will use this action, you will get it stronger. O course it is nice to use opponents buildings but you get a full turn of opponents spies exposition when you retrieve … but of course, I need to explain the retrieve action. When you decide to retrieve you remove all laborers (yours, opponents and contractors) from your buildings, bombs and tests; you also remove all your laborers from other players buildings and all your laborers and contractors from the map. What does it means ? It means that all the blocked actions on the map (including espionage) become free again and also, unlucky, all the buildings on your personal board. That means that, starting from the player on your left, all the opponents have the opportunity to use the espionage action and, probably, your buildings will be a nice place to spy! When retrieve could be an important decision and it is not so rare to see players retrieving long time before having used all the laborers, just to tactical/strategic considerations. Then, finally, we arrive to bombs. There are two kind of bombs: uranium and plutonium. Uranium bombs are straightforward: they give you the displaced points. Plutonium bombs have two different scores: untested (low) and tested (high). To get the tested score you need to test (discard) a plutonium bomb during the game and take the test counter (that can give you some points if you are one of the first testers, but less points than the discarded bomb). Plutonium or Uranium ? Two different roads to victory: usually you have to decide if you are going in one or the other direction since you need to construct reactors or enrichment plants and it is better (more efficient) not to mix too much. Test or not to test ? It depends. Of course winning the game with only untested plutonium bombs it’s not easy: on the other side discarding a bomb for testing is not a light choice. You can also get 5 victory points (that is a lot) paying some money, discarding a bomber and loading the bomb. Every bomb can be loaded just 1 time but there is no reason (apart not having the money) to not load your bombs. The game ends (instant death!) as soon as a player reach a fixed amount of victory points that varies according to the numbers of players. My impression about his game is excellent: I really enjoyed it. Actually I still miss a 4 players game but it works nice with 2,3 and 5 so I have no reason to worry about. I prefer games with 3+ players but it is also an enjoyable 2 player race: of course with 2 players you miss some of the best implication of the retrieve timing. Really a great hit for Minion Games an something to play for people looking something new in the workers placement genre. On of my best 2011 releases until now. Jennifer Geske: One potential issue I see with the game is that unless at least 2 players get into espionage early, there is a huge advantage for the player that takes espionage and the temp workers. It does not matter if his buildings sustains damage as he can simply use another player’s buildings. Unless one other player has taken espionage early, it is also not worthwhile for someone to fall on the sword just to stop the spying player by taking espionage him/herself. This is likely a problem for only the first play. Otherwise, it is a good strategic worker placement game. Don’t forget about the fact that they put out Nitro Dice (which was TERRIBLE) and Five Fingered Severence (which was EXCEPTIONALLY GOOD). Minion’s really starting to bring it to the table! I’m not yet had a chance to try Nitro Dice and Five Fingered Severence. I have added to the post the Jennifer opinion about the games I missed in my first post. Can’t help it, I just have no interest in building atomic bombs. Thanks for the review. A friend has kickstarted this and hopefully it will be here soon. Quite interested in this. The Opinionated Gamers <Loved it!